Reporter for Polish Radio Three, connected with the station since 2000, he deals with cultural issues. He prepared reports for the Radiowy tygodnik kulturalny programme and the Tym żył świat and Tym żyło radio programmes; he was also the editor of the Tu Baron programme. 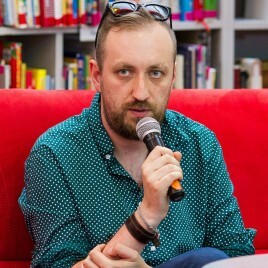 He is currently the head of the Feature Journalism Section, head of the Word Editorial Section, editor of the Klub Trójki programme, and he cooperates on the production of the Magazyn bardzo kulturalny programme. He prepares and hosts the following programmes: Z najwyższej półki, Trójkowy znak jakości, and Do południa. He co-creates the Radio Cultural Centre. He cooperates with Tygodnik Powszechny. In 2006, he was honoured for the Tym żył świat series at the 7th International Radio Festival organised by an Iranian public radio station. In 2009, he was selected as a member of the Group for Culture appointed by the European Broadcasting Union, thus becoming the first Polish Radio journalist to be included in this group. In 2012, he was honoured with the PIK Laurel for promoting books and reading. In his free time, he reads and also listens to the radio.